During my ten years as a school leader I dreaded professional development days in my district. I am not sure any educator looks forward to these monotonous experiences (developed under the guise of learning!) that are supposed to provide us with new skills and knowledge to do our jobs better. If in-district professional development wasn't bad enough, I also attended my fair share of workshops and conferences that were a complete waste of time. I attended many of these events just to meet the required hours of professional development. The problem here was that the experience focused on hours of time on task, not on the learning itself. More often than not, PD is something that has been done to us, rather than something we as educators want to engage in. These experiences made me and others come to the conclusion that professional development, or “PD,” as it is often referred to, is broken. 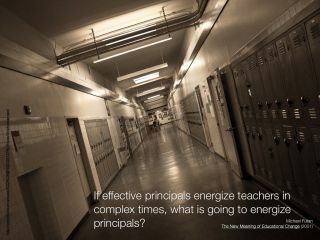 The overarching problem stems from the fact that PD is driven by external forces and outside agendas. These forces can come in the form of mandates from the federal and state government or broad needs defined by the districts we work in. Whatever the case, the end result is rarely an invigorating learning experience, and time is rarely well-spent. It is uncommon to leave PD sessions with applicable ideas and strategies that we can implement immediately to positively change school culture. The key for me was taking control of my learning and engaging in activities that aligned to my professional passions. I experienced firsthand the value of these learning activities, as sustainable change and cultural transformation took hold at my school.. My epiphany, so to say, changed my entire outlook on modes of professional development and led to the discovery of a practice area in digital leadership. All resulting learning activities focused on practical pathways that helped me to do what I was already doing better. The best part of this journey was the tangible results that followed. We need to get at the heart of what embodies great leadership and engage in learning experiences that have professional value to us while honoring our precious time. You can attend all the compulsory PD events on Common Core, PARCC/Smarter Balanced, teacher evaluation tools, and other topics imposed by outside pressures, or take a different path that will truly make a difference. To begin the process of correcting this pervasive issue lets agree to move the focus from professional development to professional learning. The next step is to identify the most pressing needs for our schools and districts that align to potential improvements in professional practice. Finally, the time comes to zero in on quality learning experiences that will enhance your leadership skills, supporting you in the construction of new knowledge and the acquisition of dynamic skills to move your organization forward. My observations of the inherent problems with traditional PD have informed my thinking about my own new role at the International Center for Leadership in Education (ICLE)− developing valuable digital leadership learning experiences in response to requests from leaders across the country. ICLE and Scholastic Achievement Partners break the mold of traditional PD. Instead of traditional, sit-and-get trainings, ICLE provides learning opportunities that are interactive, hands-on, collaborative, relevant to practitioners’ daily roles, designed by innovative practitioners and packed with practical strategies that can be used immediately. At ICLE we are proud to launch the Principal Academy this February in Nashville, TN. There will be a specific strand dedicated to Digital Leadership, facilitated with the support of renowned practitioner Jimmy Casas. Others might talk about the need or even provide solutions focusing on digital leadership and learning in schools, but Jimmy and I, as well as our expanding team, have successfully implemented these strategies in schools. We plan to guide any and all leaders (superintendents, assistant superintendents, curriculum directors, principals, assistant principals, supervisors, and teacher leaders) through an interactive deep dive into the Pillars of Digital Leadership. Attendees will learn about what constitutes good leadership and how digital tools can be used to complement the work you are already doing. We will discuss how to evaluate technology initiatives to ensure that they are supporting and enhancing learning. Everyone will leave with a practical toolkit of ideas, strategies, and tools that you can implement immediately to radically transform professional practice. You will develop a plan for action, so that you can be the change that schools and students need now more than ever. The time for fluff and theory is over. Instead, we will explore practical strategies that have been tested by leaders of diverse schools across the country. Our overall goal is to provide the best support for leaders and aspiring leaders in schools today. The event will include informal learning experiences during which attendees can interact with Jimmy and me and learn at an even deeper level. The bottom line for us is that you will see the value in the methodologies presented and understand how they can help you improve student learning and achievement, communication, public relations, and professional learning. The practices addressed in the Digital Leadership strand will help you improve learning environments/spaces, discover new opportunities, and create a positive brand presence for your school. We are excited to invite you to join us in Nashville this February. Not only do we hope readers of this blog will attend, but we also hope you will share this post with colleagues who would benefit from a digital leadership learning experience. Eric Sheninger will be the keynote speaker at the 2014 New York Tech Forum on Friday October 24, 2014. He is a NASSP Digital Principal Award winner (2012), PDK Emerging Leader Award recipient (2012), winner of Learning Forward's Excellence in Professional Practice Award (2012) and co-author of Communicating and Connecting With Social Media: Essentials for Principals and What Principals Need to Know About Teaching and Learning Science. He presents and speaks nationally to assist other school leaders in effectively using technology. His blog, A Principal's Reflections, was selected as Best School Administrator Blog in 2011 by Edublogs.